Naomi Watts was spotted gracing the Soho sidewalk in New York City yesterday (August 10), looking as glamorous as ever, wearing her third white look in a row following ‘The Glass Castle’ screening and TimesTalk. Donning a beautiful outfit that bridged the gap between film star and ultimate fashionista, Naomi wore a Rochas white pleated skirt and coordinating top with embroidered shoulder detail that we just can’t help but fall for this summertime. 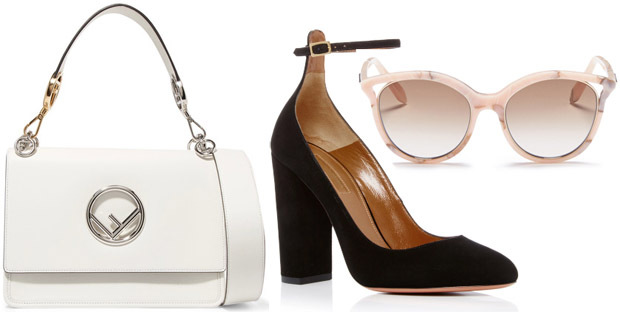 The actress completed her chic look with a Fendi ‘Kan I’ bag, lust-worthy Victoria Beckham ‘Cut Away’ shades and gorgeous Aquazzura ‘Alix’ pumps. Her Anita Ko jewels elevated her look even further.